BIG WINNER: St Martin’s Kindergarten student Sophia Patterson with the swag of awards the centre won in the Limestone Coast School Waste Reduction and Recycling Challenge. She is congratulated by Labor MPs Clare Scriven and Tony Piccolo and Limestone Coast Local Government Association chair Erika Vickery. 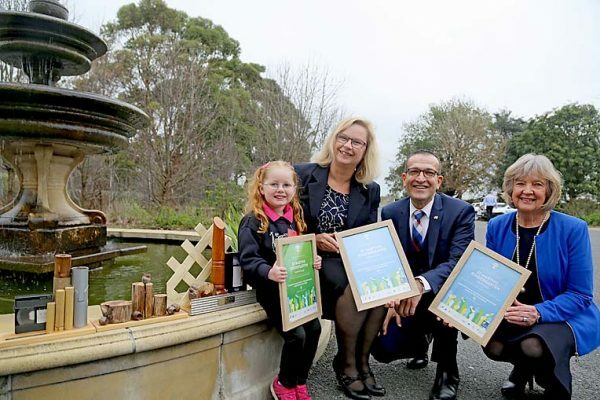 YOUNGSTERS in the community are leading environmental sustainability with St Martins Kindergarten winning top honours in the Limestone Coast School Waste Reduction and Recycling Challenge.